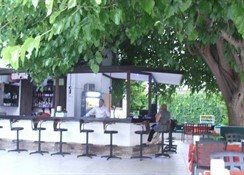 Safir Hotel Bodrum is located in bitez right beside the aqua marine sea. Bitez is on of the attractive region in bodrum. Bitez Bay, which is 45 km to Bodrum-Milas Airport, 8 km or 15 minutes to Bodrum centre, with the sandy beach along the bay, sea getting deeper with a smooth slope, restaurants lined up through the bay at the beach for every taste, is one of the indispensable resorts not only for surfing addicts, but also for the people dreaming a quiet holiday in the nature and for those who want to be close to the colourful life of Bodrum. The Safir Hotel is a charming, budget hotel offering good, basic facilities with a lovely pool area, located only 50 metres from the beach.The Hotel built in the typical style of the area consists of 40 rooms in 2-storey white blocks surrounding an outdoor pool, with a garden and colourful bougainvillea creeping up the walls. Facilities include a restaurant with indoor and outdoor seating, a small lobby area with 24-hour reception and seating, and an outdoor bar. 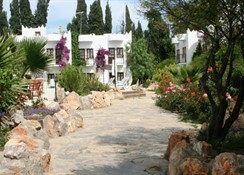 Guests also have a hotel safe, TV lounge, children's playground and room service (for a fee) at their disposal. Guests may take an invigorating dip in the outdoor swimming pool and refreshments are served at the poolside snack bar.